Have you always wanted to have juicy, succulent kebabs over an interesting conversation? You can do just that at Barbeque Nation, Bandra. With live grills and chaat counters all around you, Barbeque Nation, Bandra makes one hell of a case, coaxing you to drop your diet. The restaurant is notorious for serving you copious amounts of food starting at a mere INR 640 (plus taxes) per person. Yes, we have seen people get out of Barbeque Nation, Bandra filled to the brim. The menu comprises the best of Indian and Continental. Think mutton rogan josh, butter chicken, dal tadka, palak paneer, naan, pulao, biryani and more gracing your plate while you sip on a complimentary mocktail. And there is live BBQ on your table. Oh, and did we tell you about desserts? Well, be sure you will be bombarded with thoughts of having multiple ‘second servings’ in that section. Phirni, fruit salad, kulfi and ice cream, await you, is all that we can say at this point. Make sure you head here on an empty stomach with your gang and pig out! For good food is what keeps this world afloat. 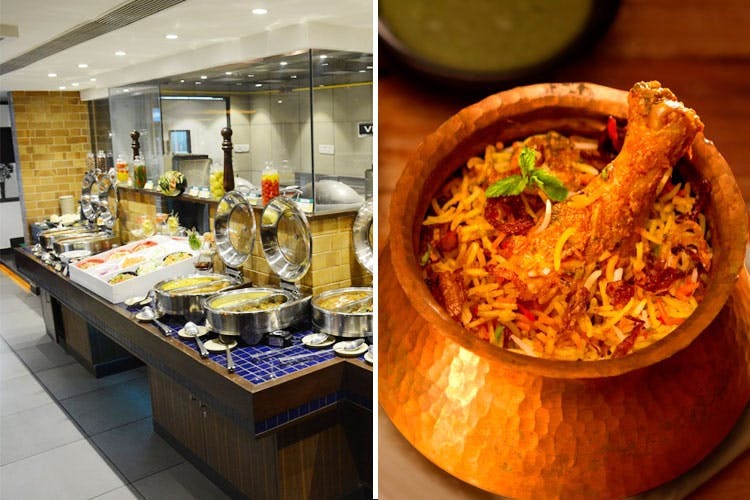 Hungry North Indians, This Bandra Eatery Serves A Delish Buffet For Under INR 1,000.